On Christmas Day hundreds of volunteers bring joy and happiness to our guests. In fact our volunteers are the heroes of the day! They can help in the kitchen, serve meals or show guests to their seats. Sometimes they even offer a shoulder to cry on for guests missing loved ones. Before the big day a small army of volunteers also sort donations and pack our Christmas hampers. Hi there, I was looking to provide help for the Xmas lunch. Possibly in the kitchen or something similar. Hi Stefano, thank you for wanting to help this Christmas. 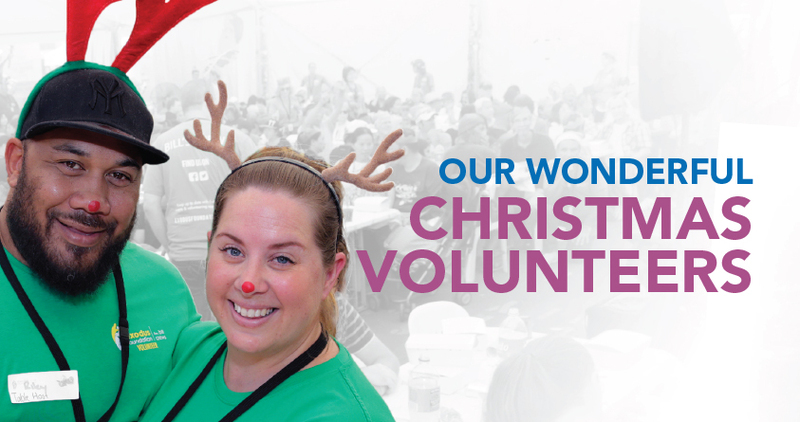 All Christmas Volunteer Positions for 2018 have now been filled. If you would like to be added to the waiting list, please fill in the online. I would like to donate my time at night one night per week if you are looking for someone to help out? Hi Will, if you would like to give our volunteering team a call on 8752 4600 or email volunteering@exodusfoundation.org.au they will be able to help you out.